Insects were here on earth long before humans. Termites, in particular, have a long history. Although their behaviour and body structure are similar to ants', the termites did not evolve along the same line. In fact, termites evolved from the cockroach about 150 million years ago. Modern cockroaches are known to be one of the oldest and most successful insects on the earth. Perhaps this long legacy gives termites their astounding tenacity and adaptability. Unlike cockroaches, however, termites exhibit complex and rigid social interactions in a colony. Particular tasks are performed by individuals specialized for the purpose. The typical termite colony is composed of members showing structural characteristics that scientists use to classify the termites. The four groups of termites, workers, soldiers, immature individuals, and reproductive each have particular roles in the colony. The workers, which are sterile, blind, and wingless, tend the eggs, feed the soldiers and the young, and maintain the nest. Protozoan living in the termites digestive tract convert wood to sugars that the termites can use for nourishment. 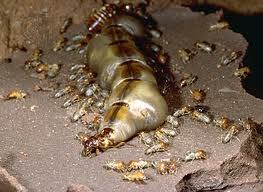 Without these one celled animals, the termites would starve. Soldiers' sole purpose in life is to defend the colony against intruders. The variety of these defence mechanisms that have been evolved in different species will be discussed later. A young individual will develop into a winged reproductive, soldier, or a worker depending on the current needs of the colony. Reproductive obviously supply the colony with new individuals. Only one pair of active reproductive exists in a colony. The king and queen are usually sealed into a chamber where they are tended by workers. The queen also circulates different chemicals among the workers for stimulating the transformation of immature termites into soldiers, workers, or "secondary" reproductive - members who will develop wings and found new colonies. When a worker feeds the queen, the queen immediately knows if a particular group needs replenishing. For example, if a large number of soldiers were killed while repelling an enemy, the queen intercepts this information from the chemicals transferred from a worker. The queen then circulates a greater amount of "soldier chemical" in the colony by exuding the chemical from its body. Workers tending the queen take the chemical to other members and the young who will eventually develop into soldiers. The defence mechanisms of termites have received a tremendous amount of attention from scientists. Soldiers rely on chemical as well as physical weapons. Some termite species bite their attacker and coat the wound with a toxic chemical that also prevents clotting. Other termites simply daub their aggressor with a built-in paint brush or inject the chemical directly. Another type of chemical warfare employed is squirting, in which the soldier termite uses its elongated "snout" to spray the enemy with toxin. The spray may also be a gluey substance that entangles the invader much like a fly is caught on flypaper. In certain species of termites, the galleries are constructed in such a way that the head of the soldiers can act as a plug, effectively cutting off an entrance for enemies. Termites have a host of general and specific enemies. In Africa, the anteater may attack a large termite mound by burrowing into the mound with its large, clawed front paws. It then proceeds to lick up any exposed termites. The insects usually can survive the attack of the anteater, because this animal does not consume a great deal of individuals. The damage done to the mound is sometimes fatal, for marauding ants, termites' principal and most deadly enemy, can attack the colony. Because a particularly hungry anteater may open up whole sections of the mound, the termites have a greater area to defend, and worse, the queen may be exposed. Although termites have a tremendous chemical arsenal at their disposal, these insects are no match for a tribe of viscous ants in these extreme conditions. Much of the time, however, the termites can re-construct the nest before they are discovered, especially if the damage is not too extensive. Based on normal feeding activity, it takes three to eight years to cause appreciable damage. There have been some predictions that, under ideal conditions, a termite colony of 60,000 workers may consume a one-foot length of 2" x 4" pine in 118 to 157 days. Termites cause over $2 billion in damages each year. 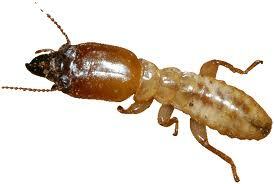 Subterranean termites cause 95 percent of all termite damage in Australia. Colonies can contain up to 1 million members. Termites treatments have come a long way since the old days. Our company incorporates the old with the new, we use both barriers to insure the customer gets the protection that they require. We also incorporate a monitoring service after when have secured there house from any attack. The monitoring service is very effective in letting us know if there is any activity around the premises. 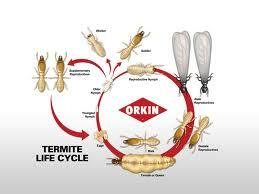 I have been treating and Inspecting for termites for 27 years, Nothing is better then experience. Coptotermes acinaciformisSeveral species of termite are found in Australia and they are difficult to distinguish from one another. Coptotermes acinaciformis is most likely to be confused withCoptotermes frenchi or Coptotermes lacteus. At a length of 5 to 6.5 mm (0.20 to 0.26 in), the soldiers of C. acinaciformis are slightly larger than the other two species. When viewed from above, the soldiers of C. frenchi and C. lacteushave pear-shaped heads while the heads of C. acinaciformis soldiers are more rectangular. Schedorhinotermes intermedius occurs coastally from southern Queensland through to New South Wales. They tend to nest in tree stumps and in the root crown area of living, dead and debilitated trees as well as in timber buried in the ground, under properties, under filled-in verandahs, and in the ground immediately under fireplaces. This species is typified by two soldier castes: major soldiers with bulbous heads and 5 to 7.5mm and smaller minor soldiers 3 to 5.5mm with narrower heads and more slender mandibles. Both soldier types do not produce the white latex which Coptotermes acinaciformis does. They are multi-site nesters whose nests may be difficult to locate as they are subterranean. 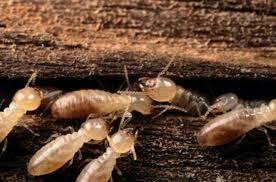 Colonies including a queen, king, soldiers, workers and reproductives may consist of thousands of termites. The minor soldiers appear first in the developing colony, followed by the major soldiers once the nest is well established. Their abundance usually indicates a well-developed and strong colony with increasing potential for damaging timber. This species is second in economic pest status to Coptotermes spp. in most parts of Australia, with their attack taking place under the protection of extensive deposits of fragile "plastering" and excavations are fairly clean with characteristic plaster-like earthen workings separating the termites from the adjacent environment. It is very difficult to evaluate its damage to buildings without a very thorough survey of its activity. Microcerotermes turneri occurs along the eastern coast of Australia from Townsville in northern Queensland to Port Macquarie on mid coast New South Wales. There are several species in this genus which occurs throughout Australia and in most instances the identification of the species is a specialist task. Each of the several species has its own particular area of occurrence with some overlap. The genus is represented by at least one species all over the Australian mainland except in the southeastern corner. Microcerotermes serratus occurs in Western Australia the Northern Territory, Queensland some western parts of New South Wales and into south Australia. Microcerotermes distinctus occurs manly in inland areas of New South Wales and Victoria. This species is 3.15-7.75mm long. They have long rectangular heads and long fine mandibles that are finely serrated when viewed with a microscope. Some species like Microcerotermes turneri and Microcerotermes serratus may build small mounds nest underground make arboreal nests and nest on top of posts. The outside layer of the nests is rather thin and easily penetrated or broken. The other species are entirely subterranean in nesting habits. The several species of Microcerotermes damage wood in service but it is mostly weathered and decaying and in contact with the ground such as posts, poles and fences. Their nesting habits (mounds, arboreal nests) often betray their presence and facilitate their control. Nasutitermes walkeriNasutitermes walkeri has the largest soldiers (5 to 7 mm) and is encountered in coastal bush land from Sydney to Cairns, where it constructs characteristic arboreal nests. Colonies appear in the root crowns of trees where there is decay or fire damage. When the colonies are well established and numbers large, they construct arboreal nests higher up the trees but maintain soil contact with galleries extending down the tree trunk. The outside casting of their nest is soft and friable, easily broken and penetrated. The arboreal part of the nest is often connected to another part of the colony in the root crown area or another subterranean part of the tree. The connection between the two sections is both internal and external. Shelter tubes are dark brown to black and often seen on the outside of the tree trunk. Nests are large and populous. Subterranean tunnels just below surface level radiate from the base of the tree to various food sources. Although damage may be done to fences, poles and wood in the ground, attack of buildings is associated with decaying wood and high moisture.